Can anyone comment on the quality of the recording on the red vs the black? Impressed. Great sound! Destroys the CD in terms of dynamic and detail. My copy is a bit noisy but nothing too bad. It is worth it anyway. Awesome reissue which is not a surprise coming from 4AD. I have the OG 4AD press but I love this LP and wanted another copy as the go-to "play" copy. Was bummed to find a few tracks had etch marks in the vinyl causing terrible pops/clicks. Same thing with the Title TK repress - a few tracks with etch marks/LOUD clicking. Seems like an obvious pressing defect but when I asked someone at the label distro about it they said they hadn't heard any other complaints...I'd hate to think a defect is on a lot of copies but a bit surprised no one else has mentioned it on here. If all the credits here are correct, this is not a remaster and the original cut was from a 16/44 source. I emailed Abbey Road (where the credited lacquer cutter now works) inquiring about this and they relayed this reply from Miles Showell: “Although I did cut [Pod and Last Splash]...this was in the early 1990s for the original vinyl releases. I did a lot of work for 4AD at that time. In those days they would almost certainly have supplied me with the American EQ’d Production Masters which would have been on the SONY 1630 (U-Matic cassette based) digital format. 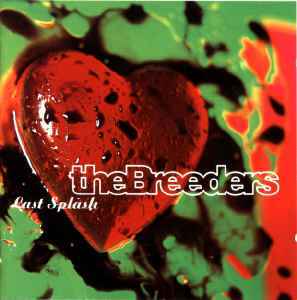 This had a resolution of 16 bits and a sampling rate of 44.1 kHz..."
My copy of this came without The Last Splash album itself. If anyone is selling just the album in the LSXX artwork give me a shout. Plain Recordings is not a pressing plant. They are a reissue label that does not press it's own records. According to the runout matrices, this was pressed at Rainbo, which is in fact a very inconsistent pressing plant with serious quality control issues. Blame Plain Recordings for more serious offenses like choosing Rainbo and having questionable mastering sources. So much better than the trash Plain Recordings reissue. Believe the hype, this is the one to own, do not bother with the reissue, however tempted you may be by the lower price. Why on earth did they leave "No Aloha" out of the Stockholm show? Seems redundant to have to also track down the "Live In Stockholm" CD just for that one song!